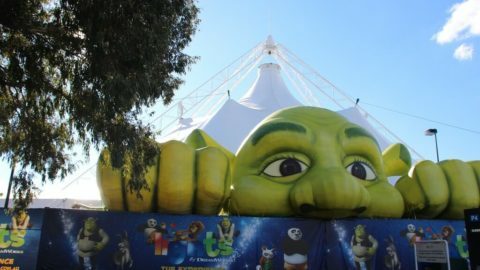 If you’re looking for family-friendly events and activities for the month of May, then Buggybuddys has you covered with a list of May Family Events in Perth that is bound to have something to interest everyone. Get ready for five magical days of creativity, connection, learning – and family fun! Scribblers Festival is a new literature and arts festival for young people brought to you by cultural non-profit FORM, with the Town of Claremont. It strives to engage, inspire, empower and transform young minds through reading, writing, art and creativity. From 9-13 May 2018, Scribblers will open a whole new chapter of storytelling for Western Australia’s students, teachers, and children of all ages. We’ll bring authors and illustrators from around the world to gather in and around Claremont. The free Families Program (12-13 May) includes hands-on activities and author talks, with some special ticketed creative workshops. Young scribblers will be able to find their inner poet, contribute to a collective cartography, and celebrate the special women in their lives at our Mother’s Day Market on Sunday 13 May. There will also be three days (9-11 May) of schools programming, supporting the brilliant work of teachers with sessions on creativity, visual literacy and word play, and with resources that will help teachers in the lead up to the Festival and back in the classroom. Students will have the chance to meet leading writers and illustrators in children’s and young adult literature, and spend time exploring their own creative storytelling. Enjoy Woodbridge, a grand old home with iron lacework, parquetry, polished jarrah, tessellated tile floors and many original furnishings. Learn about the site’s link to Captain James Stirling, Guildford Grammar and Gallipoli. Enjoy free entry during weekends to National Trust properties in WA during the Australian Heritage Festival. Peninsula Farm was one of the first farms in the Swan River Colony and one of the earliest metro residence still standing. Today Peninsula Farm offers a tranquil experience where you can enjoy a meal on the banks of the Swan River under the oak trees. Enjoy free entry during weekends to National Trust properties in WA during the festival. Café on site – call ahead for bookings. Every Sunday from 8am to 12noon, under the beautiful Morton Bay fig trees you will find an array of stall holders selling locally sourced Fresh Fruit & Veg, Meat, Seafood, Bread, Pasta, Gourmet Products, Coffee, Delicious Food, Pet Treats, Kids Entertainment, Live Music, Pop Up Stalls & More! Come along to Stockland Harrisdale’s Early Learning Music Workshop and immerse your child in music. Free of charge and suitable for ages 6 months to 4 years. A qualified educator from Forte Music will be conducting workshops on the first Wednesday of every month, with the first one starting on the 2nd of May. The lesson gives children the opportunity to experience a wide range of musical activities in a nurturing and safe environment. Bookings are essential and limited to 10 children per class. We’re excited to announce our pop-up skateboard park will be back in Lower Henderson on Thursday 3 May from 11-3pm. Come and show us your skating skills or watch the experienced skaters from Skate Sculpture. You’re welcome to bring your own gear but you can also borrow equipment on the day. There will be a DJ, some sweet treats from the Red Frogs and, of course, it’s all FREE! 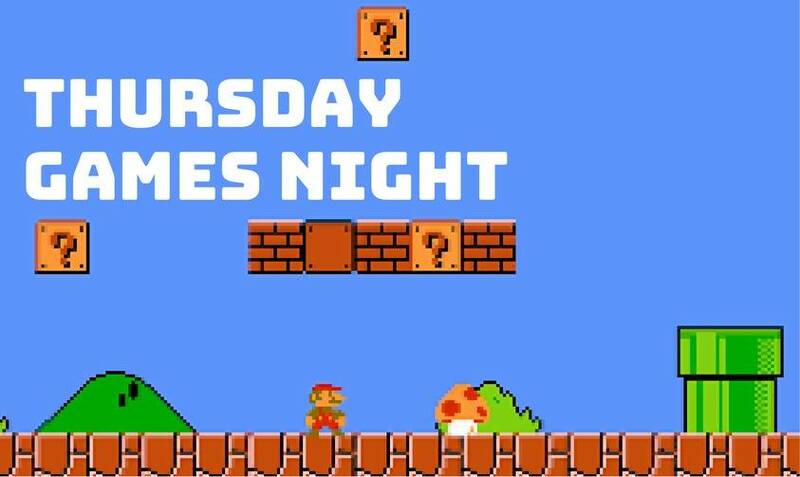 Come and relive your youth with some classic 8-bit games, retro board games and some more modern games to keep you entertained throughout the night. Hosted by Mark from our Wednesday Quiz nights, there will be competitions, meal specials, drink specials, prizes and giveaways throughout the evening. 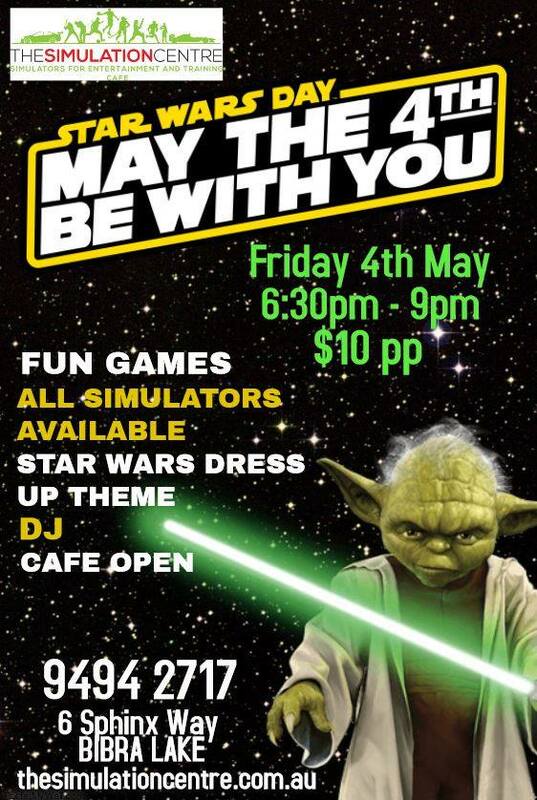 Head down to The Simulation Centre in your Star Wars theme dress up on 4th of May for a night of fun and games. All simulators will be available and our Cafe will be open for delicious snacks and drinks. This 4th of May put your Jedi robes on, clip on your Lightsabre(s) and make a light speed jump to the Perth Observatory to celebrate Star Wars Day. Our telescope operators will show you stunning objects whether it’s a planet the Death Star could destroy, or a massive nebula to launch an attack from. We’ll have prizes for the best adult and child costumes. So please come along to our May 4th event at the Perth Observatory in your fav intergalactic gear. There could even be a Star Wars character on site, you never can tell! Join us for an evening of community spirit, live music and kids’ activities as we come together to raise funds for our community’s most vulnerable. On any given night, 1 in 200 people are homeless in Australia. There are almost 10,000 people experiencing homelessness every night in Perth and 7,000 living in insecure housing. 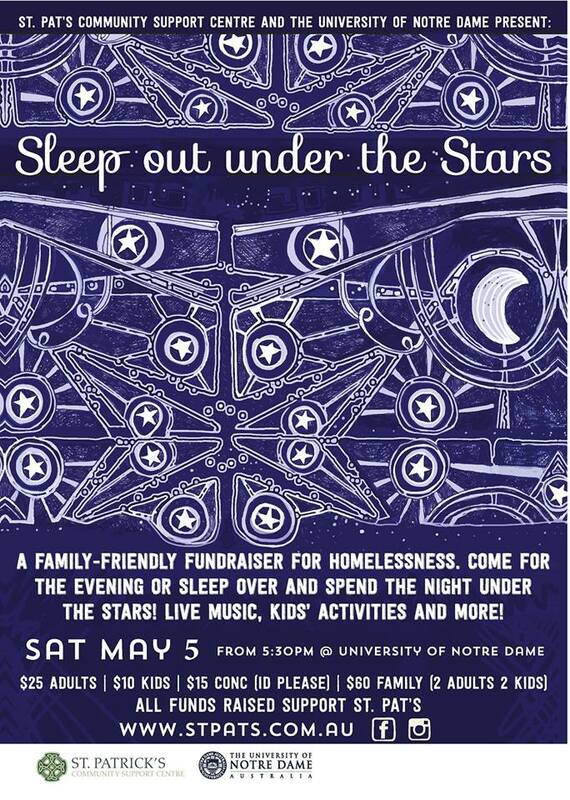 On the night of 5 May 2018, The University of Notre Dame and St. Patrick’s Community Support Centre invite you to sleep out with us in the Malloy Courtyard. Funds raised will go directly towards providing homeless individuals and families with a broad range of services promoting self-worth, independence and social cohesion. Come just for the evening of stay overnight – we’d love to see you! A memorable day for Mummy & Me! 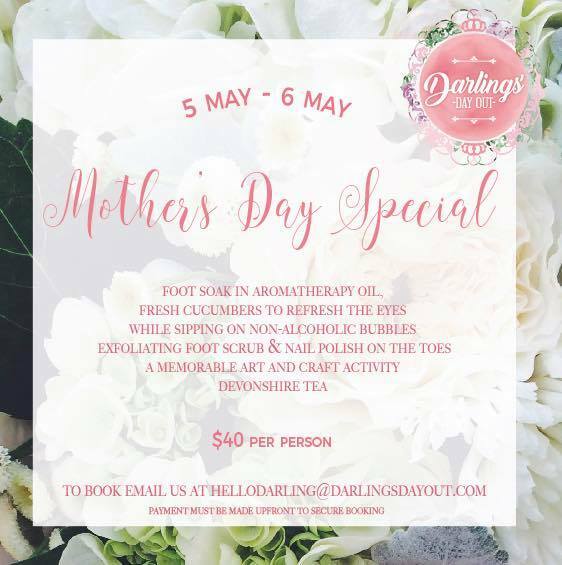 This event allows you to sit back with your darlings and be pampered. While sipping non-alcoholic bubbles relaxing you will have refreshing cucumbers on your eyes and having exfoliant foot scrub. Finished with a toe painted in a cooler of your choice from our non-toxic vegan free nail polish range. Included in your package is a memorable arts & craft for you and your darling to create something to take home to treasure forever. You will also have a Devonshire tea served to you in our stunning venue. Three sessions per day, starting from 9am, $40 per person. On Saturday 5 May 2018 you can join an incredible group of women and men on a special journey to celebrate the women who have survived cancer, to give courage to the women who are still battling cancer and to remember our mothers, sisters and friends who are no longer with us. You can walk 30kms or the marathon distance of 42kms enjoying Perth’s beautiful outdoors. There will be fun along the way at Hawaiian shopping centres, great food and plenty of support. By walking with the Harry Perkins Institute of Medical Research you will be helping to bring brilliant minds together right here in Perth to focus on the tough cancers that face women, particularly the hard to treat breast cancers and ovarian cancer. Together we can defeat women’s cancer. Register online today. Drop in and enjoy good company and great food & drinks! Short Order Burgers – the best in Perth. Beer: craft, wine, bubbles and softies. SHARE YOUR IDEAS about the future of our town centre and find out about the Bayswater Urban Regeneration Hub, a partnership between Future Bayswater, Curtin University’s Master Architecture Students and Bendigo Bank. Winged Sprintcars take to the track to battle for Northam Sprintcar Challenge at AVS. Open to all Winged cars. Tickets available online for this family friendly event. More excitement as Perth’s annual Honey Festival moves from the Swan Valley to the newly-developed Yagan Square in the city. 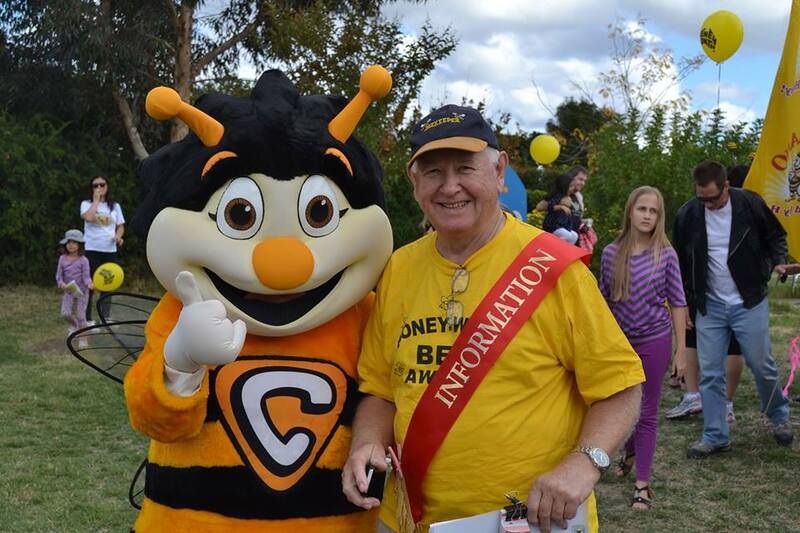 This year there will be various exhibitor stalls, beehive displays, candle-making workshops, an Ezyloader demonstration, the Honey competition and Cake competition and family-friendly entertainment such as face painting and the waggle-dance session The event held on Sunday 6 May will attract beekeepers, industry representatives and considerable general public interest at its new home in the CBD. WA Food Ambassador Don Hancey will also be on hand to cook up some culinary delights in the mobile kitchen using products from Capilano Honey. May Day Festival is an annual celebration of all workers across the world. This year the May Day Festival will be celebrated by all Unions on Sunday 6th May 10am to 2pm at Fremantle Esplanade. You can look forward to live music, free kids entertainment, a lunchtime sausage sizzle and a competition for the best dressed 4-legged-friend! There will also be speeches from Sally McManus, Meredith Hammat and the Working Voice Choir. Get your free tickets via Eventbrite and we will see you there! Come and discover Kanyana this Harvest Festival. Food and drinks stalls will be available. $5 for adults. Kids under 16 are free. Fabulous value. Tickets for sale at the event. 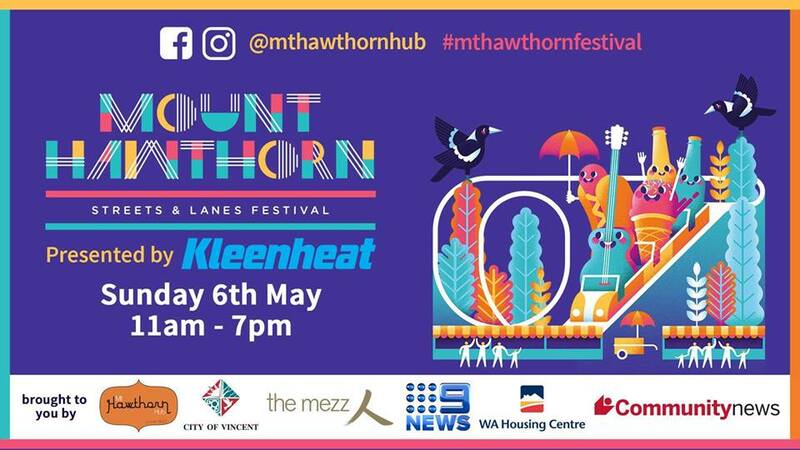 Join the people of Mt Hawthorn as they take their party to the pavement along Scarborough Beach Road on Sunday May 6 – from Oxford Street to Coogee Streets and all the little nooks and crannies in between – for the 2018 Mt Hawthorn Streets and Lanes Festival. From 11am – 7pm the streets of the precinct will be bursting with activations from local traders and communities, incredible artists and musicians along with market stalls, street food, pop up bars, open air restaurants and galleries and stacks of free family fun. – the return of the much lauded John Carey Dog Show. Falling a week before Mother’s Day means you can select a perfect gift for mum while you are here! 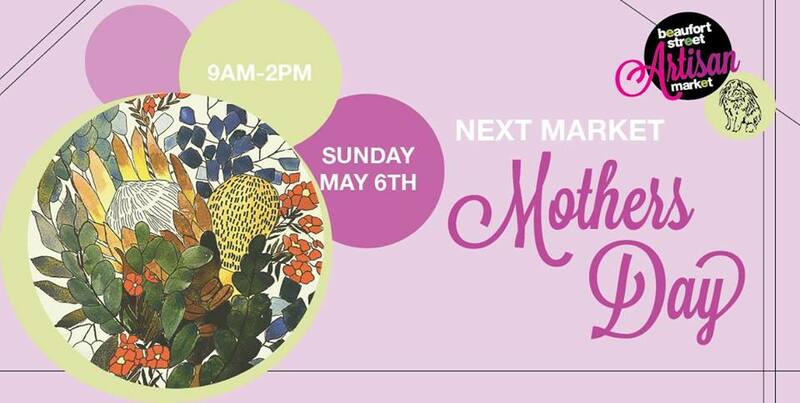 Find artisan quality handmade items and objects from the talented women featured in The Ladybird Market and a heap of fun and interesting things are on offer from the General Vendors. It’s our annual Steamfest event with all things steam. Weather and other circumstances permitting we will be running steam locos only. We will have visiting steam trains and traction engines running near the picnic area as well as static displays and more. Come on down, get the family out of the house for a relaxing day by the Canning river. Companion Card holders ride free on presentation of card. Would you love to find your Mother a unique and one-of-a-kind gift? 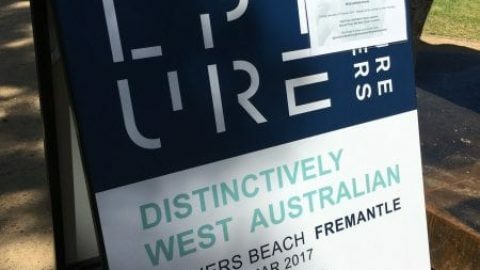 We showcase some of Perth’s best talented artists and artisans. Come and have a browse at the stall selections and see what we have to offer. There are no mass-produced items here. We also have incredible prizes to be won, each prize kindly donated from our generous local businesses (tickets on sale now, please contact us). We are still committed to showcasing the best local Western Australian artists & creatives. So come hang out at with the cool kids… shop local and support the community. Buy local and get involved! Walk or wheel 4km around the picturesque Perry Lakes Reserve, Floreat on Sunday 6 May to help us d’Feet Motor Neurone Disease (MND). The Walk to d’Feet MND is the Motor Neurone Disease Association of WA’s largest community event held to raise much needed funds and awareness for people living with MND in the Western Australia. Mc’d by Network Ten News Presenter and MNDAWA’s Patron, Narelda Jacobs, the Walk will set off at 10am sharp, starting and finishing at the ‘MND Walk Village’ in Perry Lakes which opens from 8am. There are prizes for the best dressed team, highest individual fundraiser with a new category introduced this year for the highest team fundraisers. Bring your family, friends (including your dogs on a lead) and colleagues to join in the fun. There will be face painting, a playground and Hope the MNDAWA Mascot giving out high fives and hugs. Jason of Yahava Koffee will be there with his coffee van and the Rotary Club of Como will be putting on a sausage sizzle. The township of Toodyay celebrates the life and times of Moondyne Joe by holding The Act-Belong-Commit Toodyay Moondyne Festival 2018. This festival takes place in the main street, Stirling Terrace which is closed off at 9.00am until 4.00pm. The opening ceremony is at 10am following a colourful, energetic and noisy parade with the street actors, pipe band, rifle regiment and many more. The Festival is the premier colonial festival in WA, first held in 1984, to celebrate the life and times of Joseph Bolitho Johns, known as ‘Moondyne Joe’. The festival transforms the picturesque and historical town of Toodyay in the Avon Valley into a lively daylong festival. A highlight of the Festival is the Street Theatre re-enactment of Moondyne Joe’s various escapades throughout the town, his arrests and mock trials while being a general menace. Cheer on ‘Joe’s gang’ and the floozies, coppers, swaggies and town crier. Enjoy wood chopping exhibitions, live music by The Jarrah Celts, billy tea and damper with the Swagmen, satisfy hungry tummies with a range of food trucks, plus more for the whole family. Whistlepipe Gully is a leisurely 3.5km trail in Mundy Regional Park that takes you along the gully’s edge past cascades and small waterfalls. 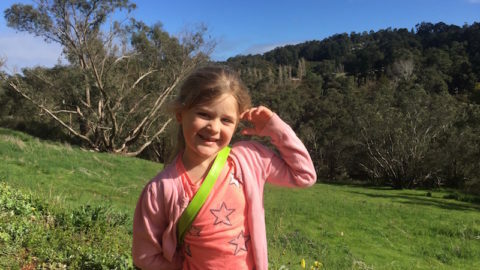 The scenery on this hike is very pretty with the banks of the gully lined with lush green foliage, paper-bark trees and a variety of wildflowers. Off The Beaten Track WA invites you to listen to the sound of the water cascading downstream as you enjoy a delicious High Tea with your beloved child on the Mummy & Me Hike Tea. Celebrate Mother’s Day a week early in a unique and unforgettable way! Includes: Guided hike, morning tea & momento. Water, camera, a good attitude and big smile! This event is suitable for children ages 4 and up. But you know your child best, if they can make the distance of 3.5km and a few small hills then they’ll be fine. Reborn Doll Show where you can buy reborn babies, custom clothing, supplies, and even a Reborn hospital centre. It has been a long time coming to Perth, so come and enjoy this event with like-minded people and join in the fun. Light refreshments will be available. Mums and Tots Yoga and Mindfulness class at Lollipops Jandakot with Yogazeit. Come join us for a relaxing and fun morning of Yoga! Everyone welcome, kids are not a requirement, although classes are catered to include kids. Yogazeit focus on Yoga and Mindfulness, taking participants through a journey of physical exercise and mind relaxation. Mats and coffee included with price. $14 will get a parent and child entry and unlimited play! 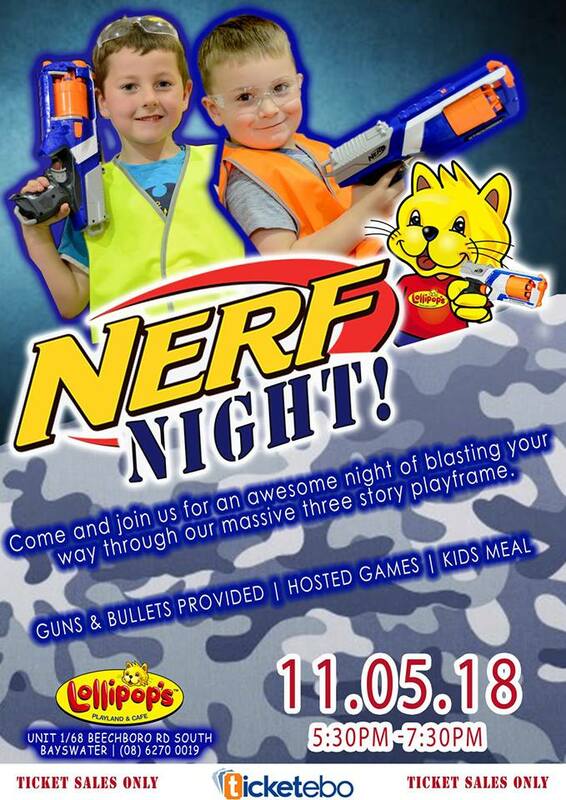 Come and join Lollipops Bayswater for an awesome night of Nerf wars through our massive indoor playframe! All equipment including guns, darts and eye protection provided! Entry price includes a meal for the kids! Cafe will be open til’ late! We are Perth’s original and largest ‘ALL IN’ high octane coffee meet and welcome all vehicles, we don’t discriminate…. whether it’s a vintage, classic, exotic, hotrod, euro, jap, muscle, street machine, modern muscle…stock, modified, lowered or lifted your welcome to join in for a morning with fellow motoring enthusiasts…bikes are always welcome as well. The Mary Street Piazza is set to come alive for the last 3 Tuesday evenings in May. Come and have a boogie with your friends and family – no experience necessary! Just put on your headphones, pick your channel and dance how you feel. All ages are welcome. The cost is $5 per person. Stay for a bit or the whole time. 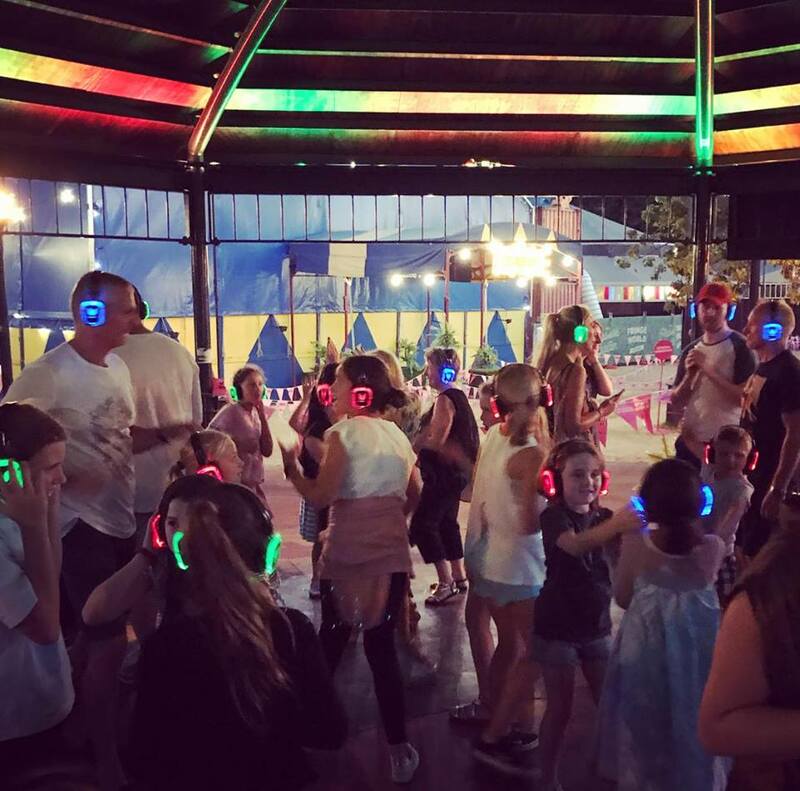 There are 50 headsets available – enough for a party! Another brand new event for the City of Canning, The Festival of Movement is an event to celebrate ‘movement’ and inspire it’s participants to celebrate a happy and healthy life. The hope is to bring together folks of all ages, walks of life, and fitness levels to encourage camaraderie, fitness, and the feeling of accomplishment. Featuring biking, rockclimbing, kids’ races, yoga, paddling, and even ultimate Frisbee and dodgeball tournaments, the festival showcases the fact that fitness can be universal — and universally fun. In a gorgeous outdoor setting with a “choose-your-own-adventure” style, the event will be packed with local and organic foods, plus exhibitors offering the latest in healthy living products and services. Greater Union Cinemas are very excited to announce the new line up for their Sensory Screenings, starting with Peter Rabbit on Sunday 20 May at 10.30am! Pre-purchase your tickets at the Candy Bar or online now! Event Cinemas are proud to bring sensory friendly films to families living with autism and other sensory needs. 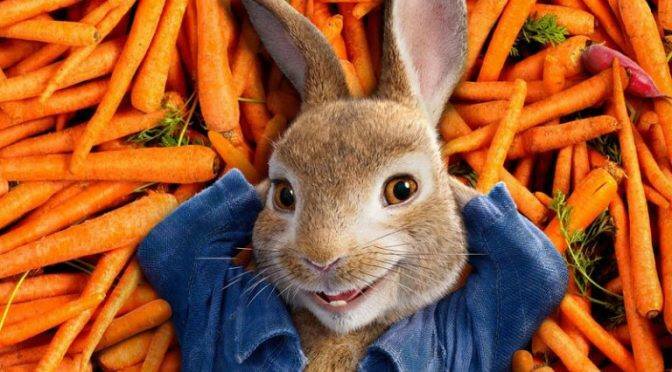 The Sensory Friendly Movie for May is on Sunday, 20 May at 10:30am for ‘Peter Rabbit’! We’ll have some furry friends joining us for this screening thanks to Rabbit Extravaganza Perth 2018! All tickets are $6 (plus online booking fee). To book tickets please head to the Event Cinemas website or please visit our friendly Box Office. Held monthly on a Sunday morning, sensory friendly screenings allow families to enjoy their favourite films in a safe and accepting environment where kids are free to get up and move around, shout or sing. The cinema lights are dimmed so you can see what is going on, the movie volume lowered for sensitive ears and volunteers monitor fire exit doors. The screenings are run with the assistance of Sensory Souls, an organisation that was developed to support families and children to have a range of fun, positive experiences in a safe and judgement-free environment. The intention is to MOVE, PLAY and CREATE so we can nourish the Body, Heart and Soul. This workshop is suitable for 5 – 9 year olds. Kids deserve to be in spaces of love and beauty and this workshop is a prime opportunity for kids to experience the beautiful space created by the Spanda Community. This workshop is run by TWO qualified and experienced Educators with a background in teaching Yoga, Meditation, Mindfulness and Art to children. Special intro price of $18 per child for a 75 min class. Come join us in the picturesque grounds of Stirling Square on the third Sunday of the month between 9am – 2pm for the Stirling Square Markets. Unique, locally handcrafted/made products along with vintage, collectables and upcycled wares. FREE CHILDREN’S ACTIVITIES including craft workshops, MEGA BUBBLES, face painting and bouncy castle. Relax and enjoy the live entertainment with a bite to eat from our FOODIES HUB or bring along a rug and have yourself a picnic. Disabled toilets on-site along with a network of easily accessible pathways for wheelchairs and strollers. In 1898 Maylands was named Maylands to little fanfare, but this year we will be celebrating the 120th anniversary with a fun filled celebration day! From 12 to 6pm, LACE in conjunction with the Maylands Historical & Peninsula Association will host a day of family friendly activities in the centre of Maylands. From The RISE, through 8th Avenue, Whatley Crescent to Railway Parade, we will celebrate our history together. 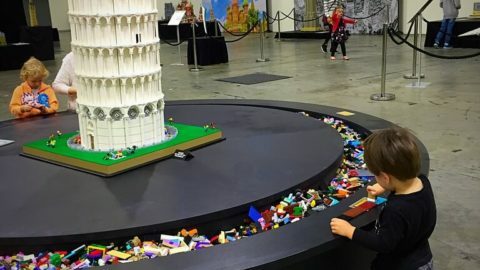 There will be activities for the young and old – with roving historical entertainment, games, rides, Pop up bars and coffee shops will meet art installations to provide opportunities for all to enjoy themselves. Visit the Old Police Station to find out about our brickworks, Perth’s first airport and how we helped build WA’s pipelines; or relax with a drink and a snack whilst listening to great roving music, or bands on the main stage. Maybe a horse carriage ride and take in some of the street art that helps make Maylands so great? On Sunday 20 May 2018, over 8,000 people and their dogs will walk to show their support for animals in need. The Million Paws Walk is a great day out for the whole family in Perth, where you will be treated to entertainment, stalls, delicious food, competitions, giveaways and a whole lot more! Whatever the age, size or breed – all dogs are welcome for a fantastic doggy day out (as long as they’re vaccinated, friendly and socialised). No four-legged friend? Don’t worry, even those without pooches are welcome to join in the fun! Register online for your nearest participating location. This is a 5k and 10k event suitable for all ages. Choose to walk or jog whilst enjoying the magnificent scenery includes the 192 Manning stairs. Join us for a morning of Garden Party fun as we celebrate the grand opening of our 28 brand new display homes at Stockland Calleya in Treeby. Come down with your neighbours and enjoy food, drink, and entertainment, meet new neighbours and let the kids run around. Traditional medieval dress encouraged as you enjoy the sights, tastes and activities of yesteryear. Be amazed as chivalrous knights test their skills in the grand arena or craftswomen weave their magic in the medieval market. Compete for best costume, feel like a King on the Throne of Swords or dine with nobility in the grand hall. 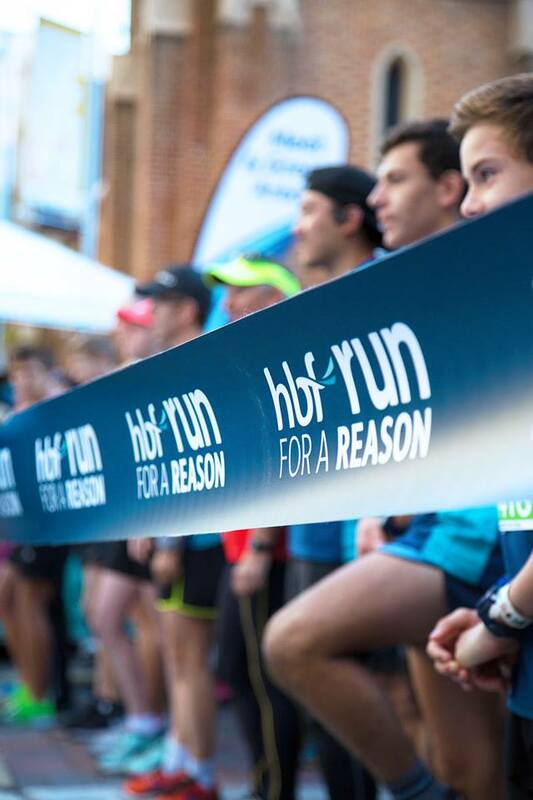 Make the health and happiness of children in WA your reason to run! Challenge yourself and change lives by fundraising for Perth Children’s Hospital Foundation. Register online to participate! Choose from three distances – 4km, 12km or half marathon. 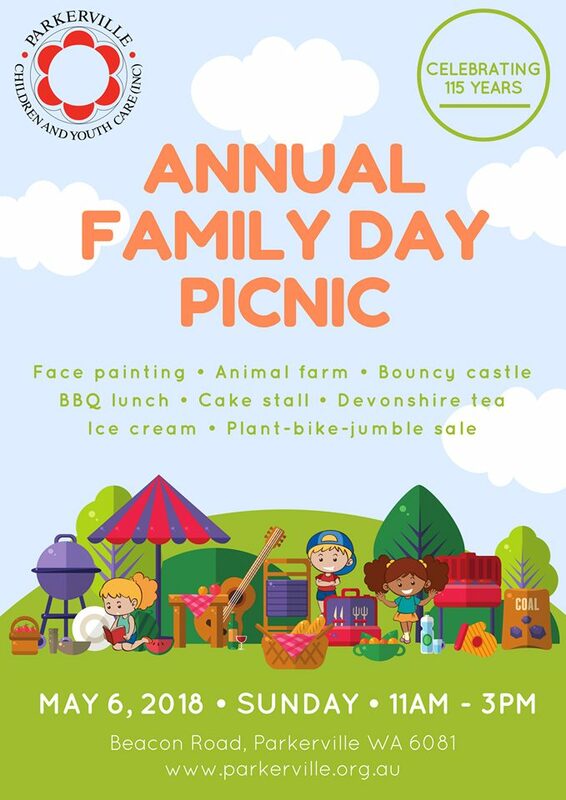 Wack on ya wellies, dress for mess and head to Bindoon to take part in the annual free family fun day all about FREE unstructured outdoor play! Mini Mud Run – FREE Tickets for the 4 sessions from Eventbrite. Gold coin entry, parking nearby, toilets on-site, large range of food on-site and close to the pits! Ugly Duckling Wines is a boutique vineyard and cellar door located in the heart of the Swan Valley right in the middle of the food and wine trail. While you are there, indulge in a mouth-watering gourmet pie made by the Bindoon Bakehaus, alongside a fresh garden salad. 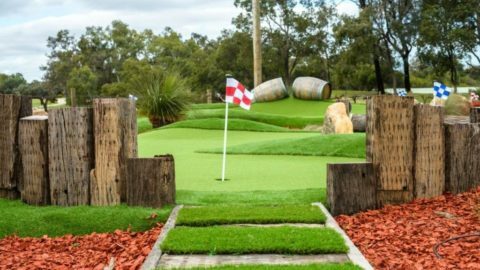 Be tempted by delicious cheese and meat platters while you relax with a glass of wine and soak up the fantastic views across the Swan Valley to the Perth hills or get in some great shopping bargains from the market stalls. In 2017 the City of Canning introduced the first Makuru Film Festival to celebrate Aboriginal and Torres Strait Islander films during Reconciliation Week. This year the City will showcase three new films in the historic Canning Town Hall. Enjoy delicious complimentary popcorn and drinks, bring the whole family and learn a little about Reconciliation Week. Surprise! Peppa Pig, George and friends are back featuring life size puppets in a brand new live stage show, PEPPA PIG’S SURPRISE. It’s a lovely day and Peppa is playing outside with her friends. Mummy Pig and Daddy Pig have got a surprise for her and George – they cannot guess what it is, can you? Enjoy fun, loads of songs and surprises in this charming, colourful, new show. PEPPA PIG’S SURPRISE promises to be the perfect theatre show for all pre-schoolers!